This is the first time I have created a thread here and hopefully I have this in the right place. 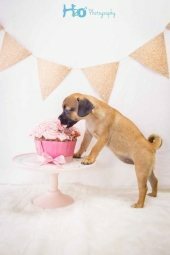 My wife has been making healthy, natural cakes for Dogs for a few years now. After we had our Daughter in 2013 it had been on the back burner. Over the last 9 months she has been doing a lot of work with her cousin (photographer) and developing recipes for a book which she will be releasing in the next few months. She has posted a recipe for making natural Easter Eggs for Dogs on her Facebook page. I have attached the recipe if you're not on FB (I'm not) and one of the photos from the photo shoot. I just grab a leaf and rub it on my skin and it seems to work. We've been making our own toothpaste for a while. Each time I mention at work about how we make so many things instead of buying them ready made - people think we're weird. But hey I know what is going into what I consume. I start with coconut oil in a jar and mix Bicarb in until its a nice paste consistency. Then I add peppermint oil to taste, or I add a drop of peppermint oil each time I brush. Nice and fresh. You can always add a little bit of salt and I've heard about people adding a calcium powder for remineralisation. Wow - that looks very special. Magic!!! Plenty to be grateful for. I'm finding the less I stress and worry about things, the more I'm blessed. Must be cold in Wyoming at the moment. I've got a mate who works at Yellowstone - would love to visit and will over the next few years. What kind of challenges does snow create for Permaculture Design? I hope life is treating you well over there. Didn't realise I hadn't signed up because I was receiving the newsletter. My Permaculture Adventure is just over a year old. I've completed a PDC and look forward to moving to acreage this year so I can set it up based on Permaculture Principles.